We offer state-of-the-art therapy that works inconjunction with chiropractic adjustments. Not much has changed since you were here last time. No need to sign in–Debbie knows you. Today you’ll head back to an adjustment room where Dr. Murray will talk about the findings from your exam and any other tests (x-rays, etc.). He’ll discuss the reasons for your problems and a customized care plan to get you feeling better. If a referral is needed now, or at anytime during your care, we’ll let you know. If you can benefit from chiropractic care … we’ll start today. 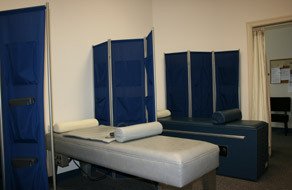 Dr. Murray has several adjusting tables that can be customized to give you the exact treatment you need. Be sure to keep the lines of communication open–talk about how you’re feeling. Dr. Murray will explain everything he’s going to do, before doing it. If a therapy– such as electric stimulation, or a ‘roller table’ as they are called– is an appropriate part of your treatment plan, you’ll head to the therapy room. It’s the perfect relaxing environment with dim lights, comfortable pillows, and even a blanket if you get chilled. Take your time getting up from the therapy table. Debbie will be ready to check you out at the front desk, and schedule your next appointment. Make sure you drink plenty of water after your appointment– you can start with a cup from the water cooler right outside the therapy room.